At Trail Appliances, you'll find a wide selection of products to meet your needs - but even well-known brands can succumb to the rigours of everyday use, so we offer product protection plans for your peace of mind. 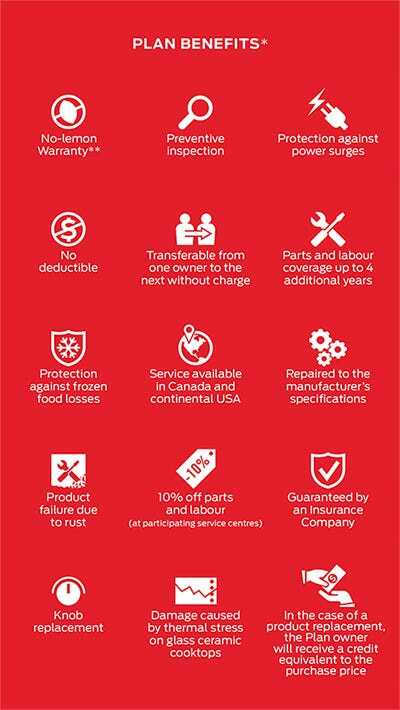 Trail Appliances has partnered with Comerco to provide our customers with the best Product Protection Plan available on the Canadian market. This plan will protect you against the expensive and sometimes recurring costs of repairs and assure you that your products will operate up to the manufacture’s specifications. From refrigerators to washers, you can relax knowing your product is covered even after the manufacturer's warranty runs out. Contact our Customer Care department at 1 888 804 3111. A copy of your invoice could be required in order to obtain service for this plan.